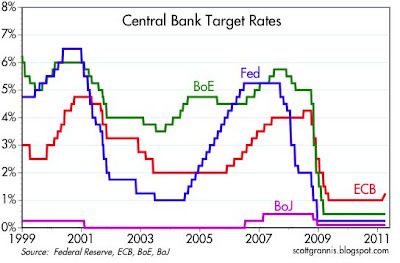 Today the ECB was the first of the major central banks to raise its target rate since the 2008-09 recession. As this chart suggests, it is likely only a matter of time before the other central banks follow suit. Moreover, this first tightening is still only a baby step, and it will almost certainly not be the last. 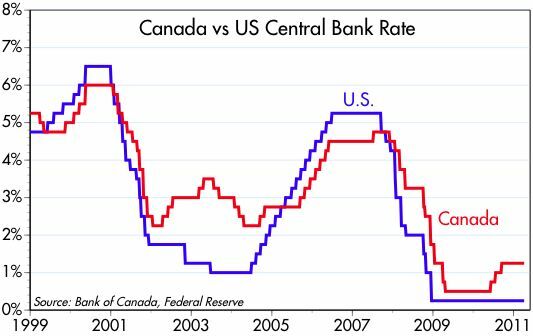 Canada's central bank started hiking rates almost a year ago, charting a proactive course—relative to the Fed—for the first time in recent memory. 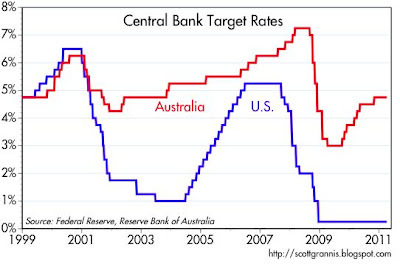 Australia's central bank stands head and shoulders above the rest. 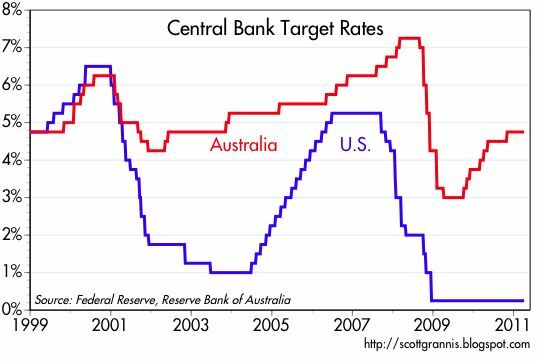 They started hiking rates back in October, 2009, and rates are far higher now in Australia than they are in any other developed economy. 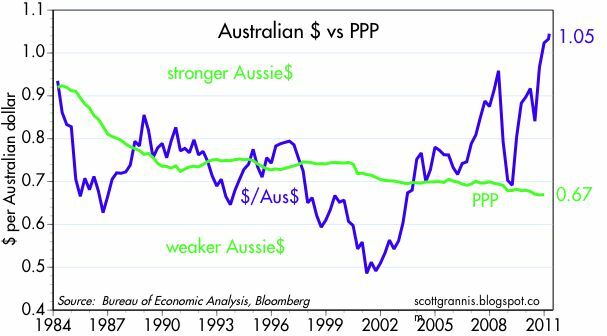 The gumption of the Aussie central bank goes a long way to explaining why the Aussie dollar has never been so strong against the US dollar, as the chart above demonstrates. Interesting footnote: in Aussie dollars, gold is worth the same today as it was two years ago, and the CRB Spot Commodity Index is no higher today than it was back in October 2008. Message: gold and commodity prices can tell you a lot about how well a central bank is protecting the purchasing power of its currency. 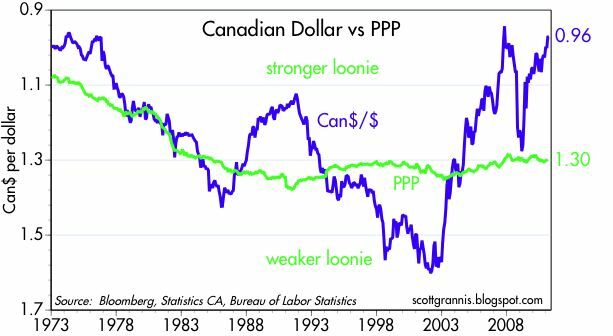 And, not surprisingly, the same can be said for Canada's central bank and its currency—the Bank of Canada has been proactively tightening and the Canadian dollar is about as strong, relative to the US dollar, as it has ever been. 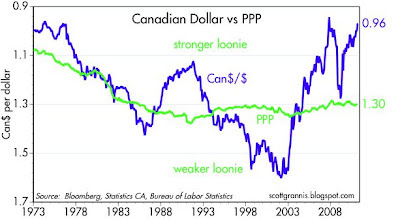 The dollar is as weak as it is because the Fed is perceived to be the central bank that has eased the most and the central bank that will be the last to tighten; the Fed is falling behind the inflation curve. By over-supplying dollars to the world, the Fed has contributed significantly to weaken the US dollar, impoverishing us all and threatening to deliver years of uncomfortably high inflation. Will someone please forward these charts to Chairman Bernanke? If the Fed is behind the curve, that augers well for US exports and GDP growth. Frankly, I hope we flood the world in dollars, and keep pumping more, Bernanke. 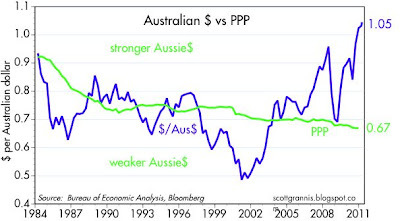 Good thing I'm long gold and the Aussie dollar!! I should buy of both as long as there are guys like Benjamin in this country who vote. Benjamin, I have a stack of new, uncirculated, consecutive Zimbabwe 100 Trillion dollar notes. I'm a multi-quadrillionaire!! According to you, Zimbabwe's GDP should be in the stratosphere!! Can we require individuals to pass a Milton Friedman 101 test before they can vote? ?